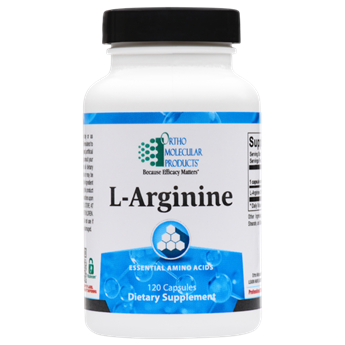 The amino acid L-arginine is a substrate for the biosynthesis of nitric oxide, a powerful cellular-signaling compound that helps blood vessels to relax. This amino acid is a potent promoter of cardiovascular and circulatory health. The amino acid L-arginine serves as a precursor for the synthesis, of not only proteins, but also of urea, polyamines, proline, glutamate and creatine. It is a substrate for nitric oxide, which plays a critical role in enhancing circulation and supporting cardiovascular health. It promotes proper platelet aggregation, proliferation of vascular smooth muscle and limiting the production of damaging reactive oxygen species. Additionally, nitric oxide is known to cause blood vessel relaxation and enhance blood flow. In this way, it helps maintain normal blood pressure and endothelial health. The L-Arginine formulation includes 750 mg of L-arginine per capsule for easy, effective dosing.